International financial transactions using foreign currency were reportedly blocked, agroindustrial and pharmaceutical sectors said. Oct 17 (teleSUR) Venezuela is replacing the dollar with the euro or yuan in its international business endeavors, Bolivarian Minister of Industries and National Production, Tareck El Aissami said Tuesday. The newest round of sanctions imposed by the United States against Venezuela is making international financial interactions impossible, Aissami said during a press conference with Calixto Ortega, the president of the Central Bank of Venezuela. International financial transactions using foreign currency were reportedly blocked, agroindustrial and pharmaceutical sectors said, showing that the U.S. financial sanctions have now extended to affect both the private and public sectors. From his personal Twitter account, Aissami said, “We have to generate new conditions to overcome these aggressions on the part of the governments of the USA, for which we have taken some actions. “They continue to try to impose exchange rates that do not correspond to rational economic formulas,” said Aissami, who is also the vice president of the Economic Ministry. “This will show you how far the madness of imperialism is coming. It is increasingly more hostile to trade with your currency,” he said. 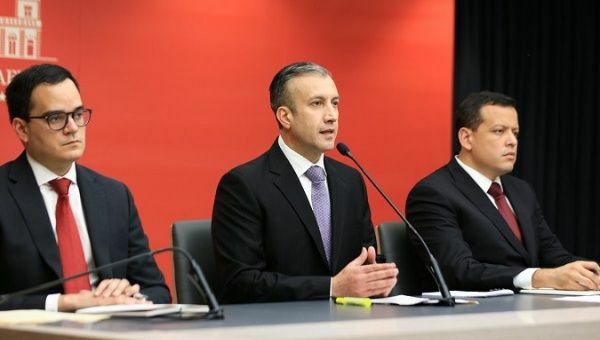 “There is an illegal, arbitrary ban- contrary to international law- on the dollar’s use…which even affects the transactions of (Venezuela’s) private sector- this is the fault of imperialism,” said Aissami. Over the next few months, two billion euros will be sold to the public market at a “real, non-speculative rate,” by members of the state as part of the country’s “Recovery and Economic Growth Program”, the minister said.